There are several places from where the beautiful Tadami Line can be photographed, as well apparently as some secret spots that only the locals know about. The viewpoint overlooking the No. 1 Bridge is situated by the Oze Kaido Mishima Juku roadside station between Aizu-Hinohara and Aizu-Nishikata Stations on National Highway No. 252. From the car park, you follow a well-kept path and then, climbing a well-maintained mountain trail for a little way, come to the three viewing points. Many photographers, either with tripods set up or cameras in hand, were waiting here for the train to pass. 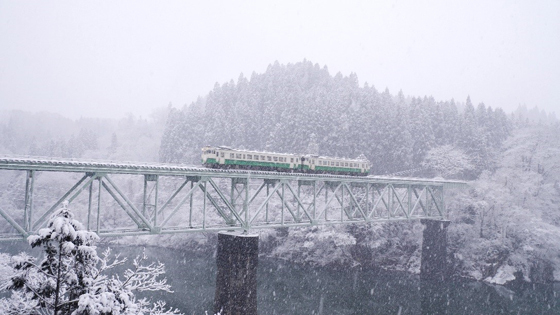 According to one local photographer, “Many foreigners come here to photograph the Tadami Line. A lot of them are from Taiwan.” Though it was difficult to tell from their looks that they were foreign, quite often the conversation that I could hear around me was certainly not Japanese. I could only take my hat off to these energetic and well-informed foreigners who had come so far to see this spot deep in the mountains. The Tadami Line is used by about 300 people a day. The carriages are KiHa 40 series diesel units manufactured around 1980. 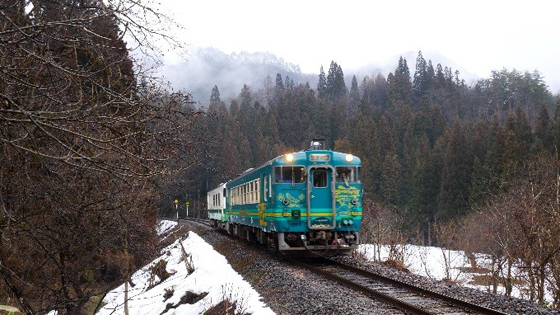 One of the train’s carriages carries a wrapping advertisement for the Tadami Biosphere Reserve (or Tadami UNESCO Eco-Park as it is known in Japan) designated by the United Nations Educational, Scientific, and Cultural Organization. 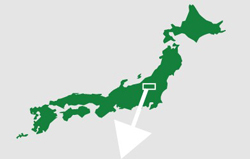 There are nine UNESCO-designated biosphere reserves in Japan; Tadami was listed in 2014. The Tadami Line, which runs along two rivers (Tadami River on the Aizu-Wakamatsu side and Aburuma River on the Koide side in Niigata Prefecture) suffered enormous damage in the Great East Japan Earthquake of March 2011 and then the torrential rain in Niigata and Fukushima Prefectures in July of that year, including the collapse of bridges and landslides damaging the tracks. 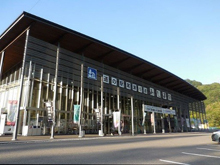 The section between Aizu-Kawaguchi Station and Tadami Station, where damage was especially severe, is still closed as of April 2019, with passengers required to change to a bus for this part of the journey. My photography this time focused on the section between Aizu-Hinohara and Aizu-Nakagawa, where the blend with the secluded Tadami River is especially picturesque. The next morning, when I peered out of the window just before dawn, I was greeted by a world mantled in snow. The previous day I had only been able to see leftover snow here and there, but today, luckily, it was a completely white scene. Apparently it was the first time that snow had settled in this area for quite a while. No doubt the Tadami Line was a whole new world as well. I headed for a good photo spot recommended to me on the previous day by a local photographer. It was a magnificent world of white. 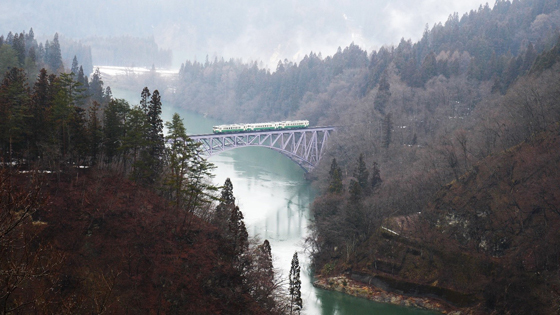 The green contour of the three-carriage train contrasted with the monotone setting as it slowly crossed the bridge. An unbelievably and indescribably beautiful and romantic world! I could well understand why people from overseas are attracted to this out-of-the-way place. Almost all of the 20 stations along the currently operating 60 km of the Tadami Line are unmanned. Seeing the trains leisurely winding their way through the mountains definitely is relaxing in a way. Perhaps this is quintessential Japanese scenery. The Tadami Line and National Highway No. 252 run alongside Tadami River. You can enjoy the train journey, or you can go around the viewpoints by car. If you do go by car, though, please be extra careful because, needless to say, you will be coming into contact with local people going about their daily life. Wherever they go, sightseers should exercise prudence. 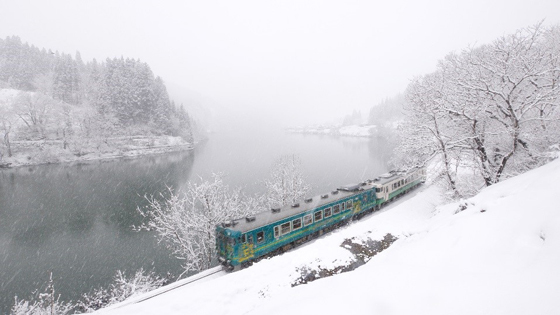 An ad-wrapped carriage of a train passing between Kaneyama Fureai Square and Tadami River. 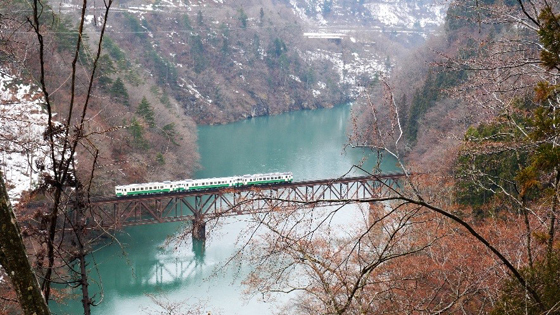 Colored bluish-green in an image of Tadami River, the carriage also serves to publicize the Tadami UNESCO Eco-Park by showing pictures of the area’s flora and fauna. 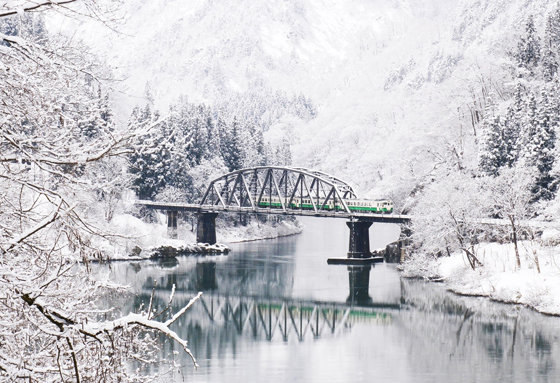 The Tadami Line and its environs can be enjoyed throughout the year. There are also numerous famous and secret hot springs in the vicinity. Combining the out-of-the-way local railway line and a secret hot spring is sure to double the pleasure of a visit. This time I stayed at the Yanaizu Onsen, which can be described as an entrance to the Tadami Line. The experience enabled me to come into contact with the friendly service and kindness of the local people. Surrounded by such regional attractions, the out-of-the-way local railway is attracting many sightseers. The restoration of the whole line in fiscal 2021 is something to look forward to. 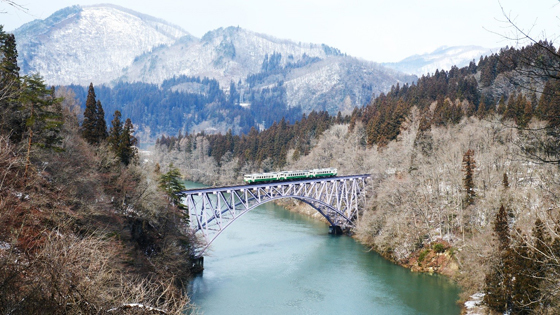 It will then be possible to view the magnificent hidden scenery of Aburuma River beyond Aizu-Nakagawa Station. Photos and text: Arata Matsumoto, Sharata and Adwise, Inc.